05:31 – Is what I’m doing right now the best use of my time? James Schramko here with some business tips. It might be time to check your merchant rates. However you’re processing your money in your business whether it’s offline with checks, with credit card swiping machines, whether you have an online facility. Go and have a look at the rate and ask your provider if that’s the best rate, what else can they do? I’ve recently changed mine and also over time I’ve asked for PayPal to reduce their amount. I’ve got a better rate from my bank and when you speak to your manager quite often they’ll cut you a better deal especially if you have a very low refund rate and if you’re putting through high volume, you should be getting a better deal because over the long term, over hundreds of thousands or millions of dollars the small percentages add up to a big amount. As the saying small hinges swing big doors. You can imagine over 3 or 4 years, several million dollars, 1 or 2% is enough to buy a car. SCAMPER stands for Substitute, Combine, Adapt, Modify, Purposes, Eliminate, and Re-arrange. That’s all pretty fancy and it’s a creative technique but what does it mean? It means that if you have a business and infrastructure and people and systems and a product in place, quite often you can go to the market place of your existing customers and get a much higher amount for your product or you might be able to get an add-on to your product. What comes before and after your product to the exact same market or you can go to a new market and make a little adjustment to your product to sell it to a completely different market. So maybe you’re selling shovels to gold miners, you can also sell shovels to builders and plumbers. Same product, different market; you might need a different way of marketing to those people but that’s where you can get a real advantage from SCAMPERS. Alright, you may be at the point where you need sales reps in your business. Sales representatives are an interesting beast, generally they come with a little bit of ego and they are always going to be trying to sell you on why the market’s tough or how the customer isn’t paying attention or wasn’t ever going to buy and stuff. They’re professional handlers so you need to handle these sales people with some discipline. It’s always good to hire 2 people at the same time as in the built to sell book because then you can benchmark from each other and you’re going to have a little bit less ability for them to make things up. Secondly, when you’re putting up your plan consider whether you want a commission only plan or whether you want to pay a base salary. Sales people refer to the base salary as appearance money. That’s what you pay them to turn up, to dress the way you want, to present the way you want, represent the company the way you want. So it changes the dynamic of the relationship. You also need to decide, do you want a hunter or a farmer? The hunter goes out, that’s business development they get new leads, they bring in fresh business and the farmer is looking after the existing customers and we’ve talked a lot about lifetime value and creating that relationship. If you have a farmer, pay them a loyalty bonus, pay them a little bit extra every time they resell to your existing customer base because that’s probably the most profitable way for you to employ. Now it may not be a pure sales person it might be more a customer relations or a CRM (customer relations manager) or a support person as doing that role as in my company. Everyone in my support is doing presales and post-sales follow up so they are effectively sales people just as I am for my business. But we use different roles as the description for what we do. Everyone’s a sales person. It’s just that when you realize that, that’s when you make the profit. 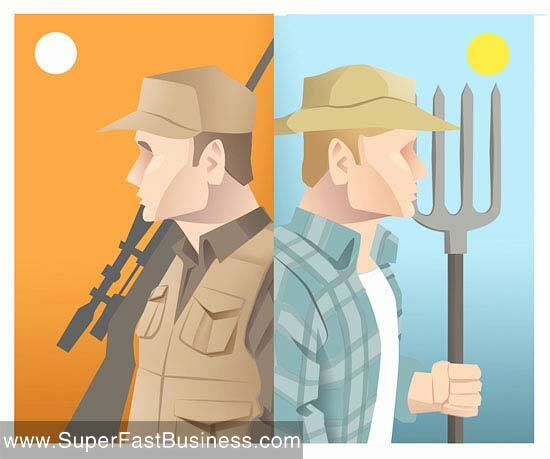 Do you want a hunter or a farmer? Be good at selling and always be looking after that existing customer because the existing customer’s where the strength of your business is. Tip for commission agreement for sales people is you can have bracket creep. What that means is the more they sell the more commission they get and that incentivizes the result you want. One of my mentors taught me, “Reward what you want” when it comes to commission plans and agreements reward what you want, that is what you’ll get. Now, when you’re selling things to customers and you have packages or services remember to talk about the result. I think a lot of people get bogged down on the deliverables, the knick knacks the specifics, forget that, and talk about the result they will get when they order from you. If you have a local business and you have customers, consider putting on a small seminar and it could be just 2 people or 3 people or 4 people. I’ve run a workshop with me and another guy training two people and I think we charged $2,000 per person it was $4,000 for one day. The two people got amazing training and we learnt about the process of delivering the content and about helping that person get a result. They went on to have amazing success but it’s the minimum viable workshop. So start small, scale big. When you pay for course, when you join a mastermind, when you buy a product, you’re not paying for the product to someone else; you are investing in yourself so get the best value from it. Make sure you consume the information, apply the information otherwise the only person who is getting rewarded is the person who sold it to you. Really the reward should all go to you. Invest in yourself and get the knowledge and implement it and leverage your abilities and you will succeed faster than if you just pay the money. You don’t get the result unless you do the work. Here’s what you should ask yourself all the time, is what I’m doing right now the best use of my time? I hope you’ve enjoyed these tips, if you’re looking for the next level, go and register at SilverCircle.com. Preregister for my mastermind group where we talk about these things every week. This is the summary of some of the things we discuss each week.